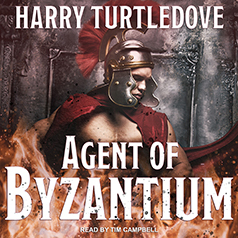 A collection of interlocking stories that showcase the courage, ingenuity, and breathtaking derring-do of superspy Basil Argyros, Agent of Byzantium presents the great Harry Turtledove at his alternate-world-building best. In another, very different timeline—one in which Mohammed embraced Christianity and Islam never came to be—the Byzantine Empire still flourishes in the fourteenth century, and wondrous technologies are emerging earlier than they did in our own. Having lost his family to the ravages of smallpox, Basil Argyros has decided to dedicate his life to Byzantium. A stalwart soldier and able secret agent, Basil serves his emperor courageously, going undercover to unearth Persia's dastardly plots and disrupting the dark machinations of his beautiful archenemy, the Persian spy Mirrane, while defusing dire threats emerging from the Western realm of the Franco-Saxons. But the world Basil so staunchly defends is changing rapidly, and he must remain ever vigilant, for in this great game of empires, the player who controls the most advanced tools and weaponry—tools like gunpowder, printing, vaccines, and telescopes—must certainly emerge victorious.